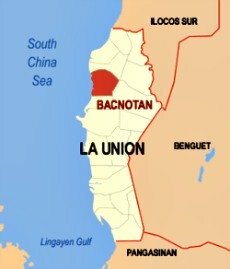 Tourists looking for off the beaten path summer getaways could find them 15 kilometers north of San Fernando City in La Union. The municipality of Bacnotan, known for its purest honey has its own share of historic landmarks, boasts of a centennial tree in Cabaroan, the 16th century church of St. Michael the Archangel, and its rich natural wonders and native products. Amidst the hustle and bustle of this peaceful town lies a splendid nature, hidden among the mountains of Barangay Arosip where only the sounds of birds singing and humming and running water are within reach. Tucked in the town’s villages is the enchanting beauty of Zim-sim ug Falls which locals say would satisfy nature lovers looking for a different fascinating beauty. Zim-sim ug Falls is located at sitio Poser, one of the seven sitios of Barangay Arosip whose dwellers include three ethnic groups the lbaloys, Kankanaeys and Ifugaos where the spot got its name Zim-sim ug or timtim-ug or bumping. The falls got its name from the rocks that collide at the common basin of the rare twin waterfalls. Aside from its being a natural spot in the area, farmers also utilize the continuous water fall to irrigate their fields. The townspeople say it can be reached by vehicle, bike or by foot. A 20-minute bumpy ride from Barangay Casiaman to Arosip barangay hall and another hour and a half walk to the site. However, mountain bikers would love the rough ride down a certain point, with the rest, a long and difficult ascent-descent track through lush forest and steep slopes that’s ideal for mountaineering and trekking. The rich green scenery and the sound of its running water provide a balanced ambiance and create a soothing effect deep within. The Serene ambience of Zim-sim Ug falls provides an excellent setting for soul searching. It can also be a good venue for weekend get-away and family adventure.